Flushed from the success of The Spy Who Loved Me, Cubby Broccoli sat in his office, dunked a biscuit in his tea, and wondered how he could possibly top it. The lavish and fantastical film had restored James Bond to his former glory and he had to plan a follow-up. For Your Eyes Only was supposed to be the next film but, mindful of the Star Wars phenomenon, his thoughts turned to Moonraker. "James Bond," he pondered aloud. "In...space!" In his excitement his custard cream fell into his tea. Outside the window a nearby pigeon did a double-take. Ian Fleming's excellent Moonraker novel with its elaborate card-game and Bond's investigation of the mysterious Hugo Drax on the Kent coast was deemed unusable except for the title and a few names and set-pieces. Instead Broccoli set out to make the biggest and silliest Bond film ever. In the film Hugo Drax, much like Carl Stromberg, wants to destroy the human-race and start again. Drax plans to create a race of super humans in space to take over the Earth. The film opens with the RAF flying a Moonraker space shuttle over Britain. Security must have been a bit lax because two rascals are hidden in the shuttle. They start the engines up and half-inch the shuttle, destroying the 747 that was carrying it. M asks where 007 is. Moneypenny tells him that 007 is on his last leg and he is, quite literally. At this point you can probably guess that Moonraker isn't going to be the most realistic stab at James Bond. Roger Moore, in a cream polo-neck and blue blazer is thrown out of an aeroplane with no parachute. He nicks one in mid air and finds that Jaws is after him in, er, mid air. Is this entertaining and fun? Well, to be honest, yes it is. Bond is sent to investigate Drax in California. He is flown over the tycoon's property in a helicopter to the strains of John Barry's music and I'm completely unapologetic about liking Moonraker for a reason that this scene illustrates: Moonraker seems like a really, really, really big film. And a stylish one too. 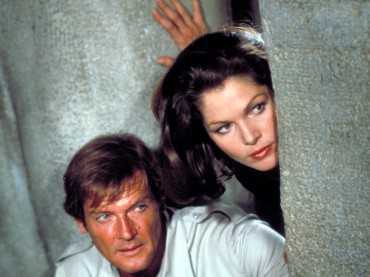 After Bond has met Holly Goodhead (Lois Chiles) and made a 1970's sexist remark "You're Dr Goodhead? Right, well, put the kettle on love, two sugars in mine" he meets Drax and is offered a cucumber sandwich. Michael Lonsdale is dryer than a cream cracker with nothing on it and seems to be having fun with his role. Drax's henchman Chang (Toshiro Suga) tries to kill 007 in a centrifuge. This is possibly the best scene in the film and Ken Adam's set is absolutely amazing. Bond's face starts to ripple as the G-forces reach a dangerous level but he remembers his wrist activated dart gun, demonstrated on that horse's arse in M's office. 007 staggers from the cockpit and shrugs off Holly's attempts to help him. Is this moment Roger Moore's finest as Bond? It might be. The trail leads Bond to Venice. "Ah Venice" as Indiana Jones said. Pigeon double-takes and a gondola hovercraft. Well, this section does take 'comedy' Bond a bit too far but the punch up with Chang in the museum is a lot of fun and quite hard-hitting. Roger Moore is often branded Bond-lite but his scraps were always well staged and he was often a lot tougher than he is given credit for. Bond investigates Drax's laboratory and discovers a toxic nerve agent under development but Drax erases all trace of the labs and is in his drawing room watching On The Buses with a bowl of Angel Delight when Bond bursts in with M and the Minister of Defence. 007 looks a bit foolish but has craftily maintained a vial to prove his theory and is ordered to fake his own death and go undercover as a bus-driver. I mean ordered to Rio de Janeiro. 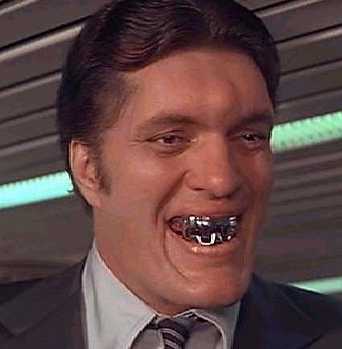 In Rio de Janeiro 007 is re-introduced to Jaws who has been hired by Drax. I did enjoy the idea that Drax had to employ a new henchman after Chang was killed. I often wonder what Jaws does when the henchman sector slows down. Does he sell double-glazing? A side career in wallpaper? Jaws going through the Airport metal-detectors is a funny gag. The cable-car fight doesn't quite work but there is some incredible and very dangerous stuntwork which you probably know all about if you've seen the DVD and the ITV documentary '25 Years of James Bond'. Jaws meets Dolly and most Bond fans wish he hadn't. Holly is captured and 007 heads for Brazil dressed as Clint Eastwood. "Balls Q?" There is a running gag where Moneypenny doesn't believe Bond when he explains what has happened to him since he last saw her. It made me chuckle anyway. Bond travels up the amazon in a speedboat searching for Drax's research facility and is predictably attacked by several other boats and Jaws. Good fun although some poor back projection surfaces in this scene. Some of Drax's perfect women entice Bond inside a jungle temple and after a fight with a rubber snake 007 is reunited with Jaws and Drax. Drax's control room is another amazing set. Imagine what the The Crystal Maze would have looked like if it had a budget of $100 million an episode and was designed by Ken Adam. Bond and Holly are tied in the blast pit underneath a shuttle about to take off. They escape and pose as pilots in a shuttle of their own. Derek Meddings work still holds up very well. The final half hour in space sees the end of Drax and his space station and something that few people ever expected to see in a Bond film - a gigantic battle in space with lasers. Oh, and Jaws turns from villain to goodie. "I think he's attempting re-entry, sir!" says Q in the end. Your tolerance for this depends on your weakness for just one sci-fi epic comic book Bond with a lot of comedy and a very seventies feel. I have no problem in admitting that I enjoy Moonraker on these terms although it is hard to think of anything more way out ever appearing again in the form of a James Bond film. Except perhaps making the villain a milkman with an interest in spiritual literature attempting to take over the world with hallucinogenic yoghurts. Moonraker has been criticised for being gadget intensive but I disagree. Apart from a wrist gun, a ballpoint pen equipped with a hypodermic needle, a cigarette case safecracker, a watch with an explosive charge, a mini camera, a flame-throwing perfume bottle, a radio transmitter, laser guns, a gondola that can turn into a hovercraft, a speedboat that turns into a handglider, and about two million gizmos in Drax's various bases, there are very few gadgets in Moonraker. And I didn't notice any 7-UP product placement anywhere. If 7-UP would like to rectify this by sponsoring me please send an email and any products you would like me to advertise. I'm sure we can work out a suitable fee. Overall I'm charmed by the boldness and spectacle of Moonraker. It has classic cinematic Bond moments like the centrifuge and Bond shooting the sniper in the tree. It has a great villain and some great lines ("Mr. Bond, you defy all my attempts to plan an amusing death for you." "You appear with the tedious inevitability of an unloved season. "), amazing production design and special-effects that still work today. If you can take it for what it is Moonraker is a fun way to spend a couple of hours. Now, if you'll excuse me, I'm going to put on my polo-neck and blazer and go and listen to disco Moonraker.